Once again we were invited to attend the Lostock Hall High School Sports Award to present the senior games captains for the year Lewis Award. The award is given to the senior captains for their commitment and excellence in sport. This year the senior girl’s captain is Phoebe Child (pictured) and the senior boys captain Jack Airey (unable to attend the evening due to sports commitments) The evening was a great success and the guest speaker this year was Goldie Sayers who competed in the Beijing Olympics and the 2012 London Olympics. This entry was posted in Awards on 05/06/2014 by Gary Baldwin. 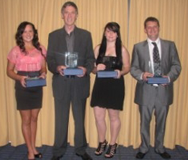 The borough’s rising sports stars have been honoured at the sixth annual South Ribble Sports Awards. The glittering ceremony, held at the Civic Centre, Leyland, celebrated the achievements of South Ribble’s sporting heroes and their clubs. A talented Latin American formation dancer; a dad who began helping out the local rugby club when his son joined, but ended up running it; and a young volunteer who leads her group in dance activities were among those honoured. Dancer Natasha Hall was named rising star of the year this year re-named The Lewis Balyckyi Award after a previous winner.after impressing judges with her talent and dedication in Latin American formation dancing. The 15-year-old has won two Junior British Open Championship titles this year and, along with her team, has qualified to the World Championships being held in Lithuanialater this year. Natasha also reached the finals in Sky1’s TV show Got to Dance… and all while studying for her GCSEs! Lewis Balyckyi won the award in 2008 for his achievements in cycling, but was tragically killed in a road traffic collision during a training ride. The award will now bear his name to inspire others and so that his determination and commitment to his sport will never be forgotten. Winners were announced in nine categories: special recognition, school leadership, Lewis Balyckyi rising star, young volunteer of the year, coach of the year, club of the year, lifetime achievement, special recognition schools award and active zone young person of the year. Guest speaker on the night was local martial arts expert and actor Mark Strange, who has represented Great Britain around the world in kung fu and has also appeared in a number of films alongside martial arts star Jackie Chan. The 2011 sports award evening was a great evening we had been invited by Mr Lowe the head teacher as the school decided to create an award called “The Lewis Balyckyi Award” along with the presentation of this award there is a guest speaker and this year it was Helen Clitheroe who gave a great talk on her career as a runner, Helen won Gold in the 3000m race at the European Indoor Championships 2011 which was held in Paris and also won a Bronze in the 1500m Commonwealth Games 2002 which was held in Manchester. The winners for 2011 are Oli Ballard and Sophie Richards who both excelled in sports throughout their time at Lostock Hall. It was with great pleasure that we where once again invited to attend the sports award evening which recognises all the efforts the children have put in to their chosen sport. It again was a great evening and the guest speaker this year was Neil Parsley who was formerly a professional footballer Neil did a great talk in motivation and the aspects of his chosen sport. 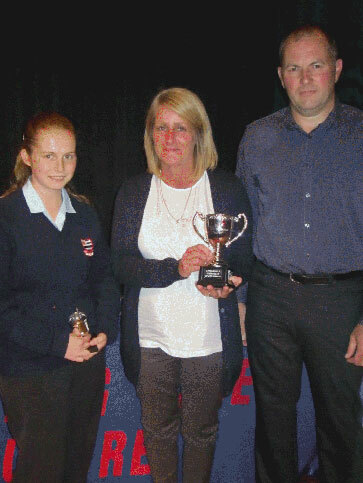 This year The Lewis Balyckyi Trophy was presented to Rob Evans & Alice Smith. We thank Lostock Hall for a great evening.